Houston’s Cyril Adams is one of the most influential figures in the revival of interest in British guns—particularly hammer guns and those with Damascus barrels—that swept America in the 1980s and ‘90s. During the period he owned London’s Atkin Grant & Lang (1984-1999), Adams resuscitated the once-great maker and aided by the expert tutelage of Ron Solari produced some of the finest sporting shotguns made in Britain during that time. In 1996, along with co-author Robert Braden, Adams published Lock, Stock & Barrel, which remains one of the best single-volume primers on the principles and methods of best quality British gunmaking. 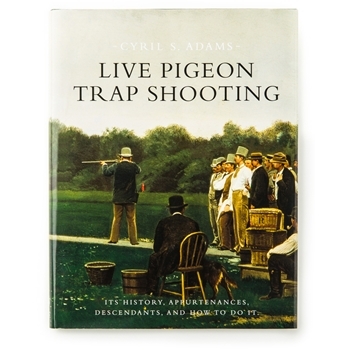 Newly out is his magnum opus: Live Pigeon Trap Shooting, the first book written in the English language on the subject in more than 120 years, and by far the most comprehensive ever published. Clearly written throughout its 275 pages, and complemented with hundreds of rare photographs and illustrations, it is encyclopedic in its detail of the sport past and present. Pigeon shooting was also popular in America, as shown in this 1891 illustration from Harper’s Weekly. Monte Carlo was the epicenter of international pigeon shooting, and its most prestigious venue. This photo likely dates from the early 1920s. Italians have been many of the sport’s most successful shooters. The stylish Duke of Abruzzi in northern Italy in 1929. As Adams explains in his overview introduction: “In the pigeon ring, new ideas for improvements to guns and ammunition could be tried against each other under consistent conditions with repeatable results. This is not possible in the field, but useful improvements developed and then proven by pigeon shooters were quickly incorporated into field guns and ammunition.” This was particularly true in the British gun trade, where pigeon shooting remained popular until the end of the 19thCentury. Successful pigeon shots were often a gunmaker’s best source of advertising and publicity. The action and excitement of a columbarie shoot in south Texas. Westley Richards was just one of many gunmakers that used the success of pigeon shooters to promote its guns. The Westley Richards “Ovundo” was offered in trap configurations and one was used by Henry Quersin to take several championships in Belgium in the 1920s. Adams—an engineer by training with a specialty in low-temperature physics—has competed in pigeon and Helice rings around the world for half a century, and is a uniquely qualified author. The book comprises seven chapters: 1) History; 2) Bird and Traps; 3) Guns; 4) Ammunition; 5) Notable Shots; 6) Descendants; 7) How to Do It. A bibliography and an appendix of pigeon and Helice championship results and the rules governing the sport round the work out—and given its quality it is the most important book on wingshooting and fine guns to be published in 2017.